Two analyst firms say that a sale is Twitter's best path forward. Analyst firm SunTrust Robinson Humphrey thinks Twitter (NYSE:TWTR) is likely to be on the auction block. Among other executive turnover, Jeff Seibert, Twitter's former head of core consumer product, has been reassigned at the company and SunTrust Robinson Humphrey cites ongoing executive turmoil as well as lack of growth as reasons to believe Twitter will eventually be acquired, according to a MarketWatch report. The analyst firm seems sure about its forecast, even using the term "inevitable," according to MarketWatch, but does not expect a sale this year. "We believe that if current trends persist, Twitter would be a top candidate in 2017" the analysts wrote, according to MarketWatch. 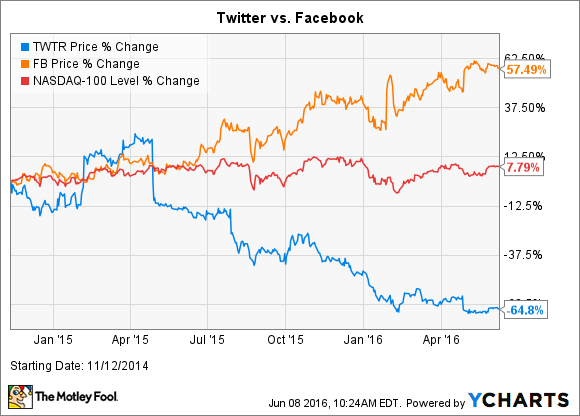 As the chart shows, Twitter's performance has been disappointing compared to Facebook and the greater Nasdaq 100. SunTrust Robinson Humphrey isn't the only ratings agency that thinks a sale is the best-desired result for investors. Last month, MoffettNathanson cut Twitter stock from "neutral" to "sell," citing advertiser fatigue, and pointedly classifying the company's new strategies as "too little, too late." After assigning a price target of $12 to the company -- it currently trades around $14 -- MoffettNathanson was quoted as saying it sees "no compelling reason" to own the company other than the possibility it may be acquired. Out of the two analyst firms, MoffettNathanson appears to have the most cohesive and comprehensive analysis. First, SunTrust Robinson Humphrey maintains a "buy" rating on the stock, with the main impetus for the rating being the predicted buyout. So-called "event investing," including buying a struggling company in hopes it will be acquired, is not for prudent investors. Second, SunTrust Robinson Humphrey's data are incorrect: The main thesis for saying Twitter should put itself up for sale is the fact that nearly 70% of Twitter's C-suite has left the company. The analyst firm included Jeff Seibert among those who have left the company as proof Twitter is losing high-level executives at a high rate. But Seibert has not left Twitter. He is no longer head of core consumer product, but remains with Twitter as the head of Fabric, Twitter's software development kit. Ironically, Seibert returns to the same role he had at the 2014 Analyst Day event that SunTrust Robinson Humphrey used to gauge C-suite turnover. Twitter's problem appears to be a divergence between a great service versus a great investment. When it comes to news dissemination, there's arguably no outlet with more importance than the microblogging site. Unfortunately for Twitter investors, it seems the number of people who find value in real-time news isn't as large as initially thought. Last quarter Twitter reported 310 million monthly active users, or MAUs, reporting anemic 3% year-on-year growth. MoffettNathanson's bearish note, where the stock was downgraded to a sell rating, was formulated after talking to major ad agencies. According to MoffettNathanson: "The commentary we continually hear is that most aren't pushing their clients to increase their budgets on Twitter or are actively steering clients away from Twitter all together." If MoffettNathanson is correct, and ad agencies are reducing ad spend on Twitter, it could be a rough road ahead for the stock. If true, perhaps a buyout is the best path forward for the company.